A recent UK study published in the journal, Acta Dermato-Venereology, discovered sunscreen users are not receiving the full blocking benefits of sunscreen because they are simply applying a thinner layer than manufacturers recommend. "Results showed that sunscreen with a sun protection factor (SPF) of 50, applied in a typical way, would at best provide 40% of the expected protection," stated in the King's College London study. Professor Antony Young from King's College London told Science Daily, "There is no dispute that sunscreen provides important protection against the cancer causing impact of the sun's ultra violet rays. However, what this research shows is that the way sunscreen is applied plays an important role in determining how effective it is." 1. Turn to an SPF of 30 or higher. 2. Make sure you're wearing UPF clothing, seeking shade when possible and wearing a wide-brim hat and sunglasses. 3. Reapply your sunscreen every two hours. 4. Don't forget to apply on your entire body, especially your eyelids, ears and feet. We all know the importance of sunscreen. Everyone needs sunscreen to protect their skin from the harmful UV rays from the sun. The sun's rays can cause sunburns, wrinkles and skin cancer. With skin cancer rates are on the rise, we're breaking down five sun safe sunscreen tips to practice throughout the year. 1. Apply 15-20 minutes before going outside. This will allow the sunscreen to create a protective layer on the skin. 2. Reapply your sunscreen every two hours. This is so important! Further reapplication is necessary if you are sweating or swimming. 3. Make sure you're applying the right amount of sunscreen. 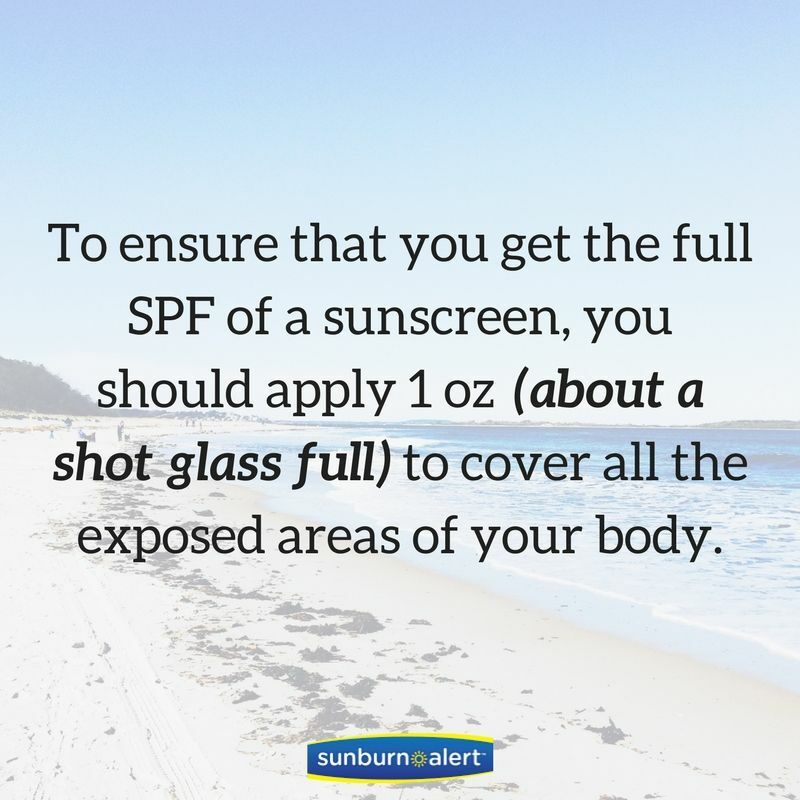 The Skin Cancer foundations say 1 ounce (about a shot glass full) is the standard amount to ensure you properly covered the body. 4. Throw out your bottle if it's expired. Sunscreens typically last 2-3 years. Check your bottle to make sure you're using an up-to-date sunscreen. 5. Sunscreen can't be your only form of sun protection. Wear a hat, seek shade when possible and opt for UPF clothing. Have you ever roamed the sunscreen aisle and wondered exactly what the term SPF meant? SPF is the measure of the sunscreen's ability to protect the skin from UVB rays –– the kind of radiation that causes sunburns. If your skin normally burns after 10 minutes, applying an SPF 15 would allow you to stay in the sun (without burning) for about 150 minutes. If it takes 20 minutes, using an SPF 15 sunscreen is meant to protect you for 15 times longer. However, you still need to reapply sunscreen every two hours. This is VERY important and an important tip to know in order to stay extra sun safe this summer. What SPF do you use? A new study from Ohio State University found that applying sunscreen reduces the risk of skin cancer by 80%. 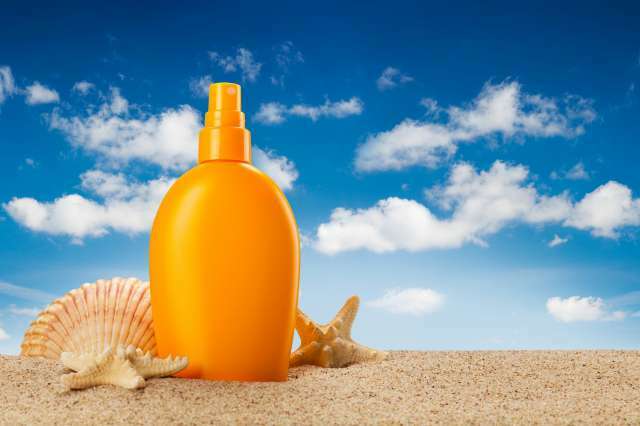 The new study tested various SPF 30 sunscreens, and found all delayed the onset of melanoma. According to the American Academy of Dermatology, skin cancer affects 1 in 5 Americans, and more than 73,000 are expected to be diagnosed with melanoma this year. Don't forget to apply (and reapply) your sunscreen this summer! Q: Does sunscreen expire? Is sunscreen still good from last year? A: According to Mayo Clinic, sunscreen does expire after 3 years. Sunscreens are designed to hold its strength for up to three years. This means you can use the sunscreen you bought last year. For older sunscreens, check the date and if you aren't sure just toss it. And, always remember to reapply! Applying sunscreen is very important. Reapply sunscreen is extremely important. 1. Apply sunscreen 15-30 minutes before sun exposure to allow for the ingredients to get into your skin. 2. Reapply sunscreen every two hours. 3. Do you forget to reapply? That's where we come in! We all know sun protection is important. When looking for sunscreen, the usual philosophy is "the higher the SPF, the better, right?" But what exactly is SPF? What does it mean & what level if SPF should we be buying? SPF stands for Sun Protection Factor. It refers to the theoretical amount of time you can stay in the sun without getting sunburned. For example, an SPF of 15 would allow you to stay in the sun 15 times longer than you could without protection. In addition, a higher SPF blocks out more rays—a product with an SPF of 15 will filter out approximately 93 percent of UVB rays; SPF 30 filters out about 97 percent. However, it's not always this straightforward. Different factors can easily effect sunscreens effectiveness. Factors such as water, sweat, applying unevenly & even your genetic makeup. If you have fair skin or if there is a history of skin cancer in your family, you may be at higher risk for skin cancer. Finally, certain medications—such as antibiotics or products with retinol—can make your skin more sensitive to the effects of sunlight. It’s also important to know that SPF only applies to UVB rays. There is no SPF equivalent for UVA. You can look for additional ingredients in your sunscreen to protect you from UVA—such as zinc oxide and titanium dioxide—but there’s no standard measurement for how long these ingredients will keep you protected. For all of these reasons, it is important to not solely rely on SPF to gauge how much time you can spend in the sun. Keep these tips in mind: buy a sunscreen that protects against UVA & UVB rays, reapply sunscreen at least every two hours, cover up with protective clothing and sunglasses, check your skin regularly for any signs of skin cancer and finally, wear a Sunburn Alert UV Wristband or Sticker for an extra reminder of when to reapply sunscreen and get out of the sun. What SPF do you wear?